Carpal tunnel syndrome (CTS) causes tingling and numbness in the hand with pain often going all the way to the elbow. Loss of sensation occurs first then weakness later as up to 5 muscles in the hand may become paralyzed. Waking up at night with symptoms is common. The median nerve compression at the wrist occurs in the carpal tunnel which has 3 walls made of bone and the roof which is a tight thick ligament. The carpal tunnel contains 9 flexor tendons and one nerve, the median nerve. Swelling of the tissue (the synovium) supplying nutrition to these structures may compress the blood supply travelling with the median nerve. This makes the nerve malfunction causing pain, tingling, and numbness. Releasing the strong ligament connecting the 2 bone walls decompresses the nerve to allow return of better blood flow to the nerve and normal function in most cases. Prolonged compression of the median nerve may cause scar tissue to form inside the nerve that may be permanent and result in incomplete return of function after surgery. Carpal tunnel syndrome may be associated with diabetes, obesity, thyroid disease, trauma, pregnancy, and other conditions. 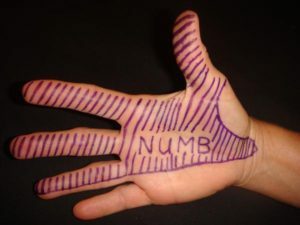 Some associated causes like diabetic peripheral neuropathy will not be corrected by carpal tunnel release. Neck problems may also give numb fingers. This is why nerve conduction studies, electromyography(EMG), are done to localize the cause of the problem. For patients considering cash pricing, our price for this surgery (includes anesthesia, facility fee, and surgeon’s fee) is $2700. Any labs or x-rays would be a separate charge. To read Dr. Hobbs’ publication on Carpal Tunnel CLICK HERE. For more information on Carpal Tunnel Syndrome, check this out.